The Full Archives of the Narcissistic Abuse List - Click HERE! The Narcissist is an actor in a monodrama, yet forced to remain behind the scenes. The scenes take center stage, instead. The Narcissist does not cater at all to his own needs. Contrary to his reputation, the Narcissist does not "love" himself in any true sense of this loaded word. He (or she) feeds off other people, who hurl back at him an image that he projects to them. This is their sole function in his world: to reflect, to admire, to applaud, to detest - in a word, to assure him that he exists. Otherwise, they have no right to tax his time, energy, or emotions - so he feels. My book, "Malignant Self Love – Narcissism Revisited", was written under extreme conditions of duress. It was composed in jail as I was trying to understand what had hit me. My nine years old marriage dissolved, my finances were in a shocking condition, my family estranged, my reputation ruined, my personal freedom severely curtailed. Slowly, the realization that it was all my fault, that I was sick and needed help penetrated the decades old defences that I erected around me. This book is the documentation of a road of self-discovery. It was a painful process, which led to nowhere. I am no different  and no healthier  today than I was when I wrote this book. My disorder is here to stay, the prognosis is poor and alarming. I wanted to talk to others, to compare notes, to learn and to support by disseminating knowledge. This is why I established this group. Its archives are by far the greatest resource available on the Net regarding pathological narcissism, the Narcissistic Personality Disorder (NPD), and relationships with abusive narcissists. Every day, between 3-5 articles are posted to its members and contributions from list members are welcome. Read The Narcissism Book of Quotes (free) - Click HERE! 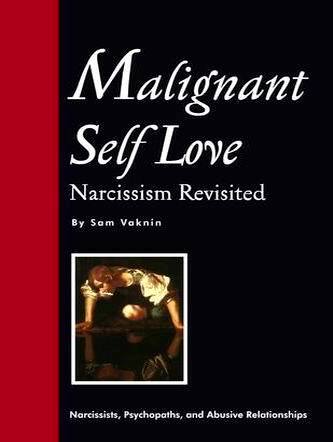 Read Sample Chapters of "Malignant Self Love - Narcissism Revisited" - Click HERE! Case Studies in the Narcissistic Personality Disorder List Part I - Click HERE! Case Studies in the Narcissistic Personality Disorder List Part II - Click HERE! English Fiction at Gorgelink - Click HERE!